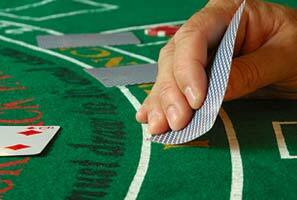 Back counting is one of numerous card counting systems which are used at blackjack for increasing chances for winning. The system which will be described here is, actually, one of the easiest card counting methods which was first introduced by Stanford Wong, the blackjack expert, writer and member of the Blackjack Hall of Fame. That is why back counting is also called to be "Wonging", and players who try to use it in practice are "wongers". If you decided to become a "wonger" you should become a good card counter first because back counting is impossible to use without the strategy of counting cards. When a gambler uses back counting, s/he stands behind a blackjack table and count cards; such a gambler enters the game only when s/he understands that high cards are left in a shoe and s/he has big chances for winning. This system does not presume any group counting: a gambler works alone here. This strategy is not illegal of course. It is just considered to be a little bit unfair because other players lose money while you observe their game and join it only when it is comfortable for you. Moreover, casino employees can easily recognize a person who uses back counting: such a player stands nearby and joins the game suddenly by making a big bet at once (other players usually start with low bets and make them higher during a game). The man who had developed the strategy of back counting is not the last personality in the world of blackjack. Stanford Wong (the real name is John Ferguson) is the world-famous blackjack expert and author of such bestselling gambling books as Professional Blackjack and Blackjack Secrets. He is also the owner of the publishing house Pi Yee Press and the author of a computer program "Blackjack Analyzer". This book describes card counting techniques available both for new comers and professional blackjack players. Here you will find the detailed description of such counting systems as HI-Lo System and The Halves. Wong is a teacher by profession and he worked at San Francisco State University but became interested in blackjack in 1964 and agreed to get a salary of only $1 in order not to attend any university meetings and have enough time for playing blackjack and developing his gambling career. Stanford Wong's website Bj 21 is a good blackjack guide for all people interested in this casino game: blackjack basics, information about card counting and advantage play, casino news and articles concerning other games, including craps, poker, video poker, sports betting and others.